for loans. But there can be an occasion, that you want to use your credit card in emergency, however, cannot do so because you are blocked. Invalid credit card can be due to various reason and requires attention. 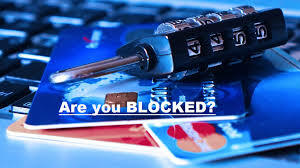 It is very important be aware of various steps that can help you unblock your credit card. Generally, the lowest credit card has a transaction limit of Rs 25,000 a month for every individual. There are host of categories in credit cards like classic, premium, gold, etc. and their transaction limit is different. The higher is your credit card, for instance gold or premium - then the higher will be your usage limit in a month. These terms are - that you have to pay complete outstanding balance of your card. Secondly, you must be an account holder of that bank and finally you must have an term deposit account with SBI.